Jimi Hendrix will release his debut Band Of Gypsys performance on a new live package due September 30. “Machine Gun: The Fillmore East First Show 12/31/69” captures the guitar icon, bassist Billy Cox and drummer Buddy Miles delivering their unique mix of rock, R&B, and funk in concert at the legendary New York venue just six months after the breakup of The Jimi Hendrix Experience. “We decided that we couldn’t do any songs that had already been released,” says Cox. “We wanted to give them something different. So we went at the project in a joyous, creative posture and ultimately developed the repertoire of the Band Of Gypsys. Band Of Gypsys played four historic concerts at the Fillmore East in New York City – two on New Year’s Eve 1969 and two on New Year’s Day 1970. Never before has the first of these sets been available in its entirety, and the vast majority of the performances have never been issued. The project was produced by Janie Hendrix, Eddie Kramer and John McDermott from the original 1” 8 track master tapes. 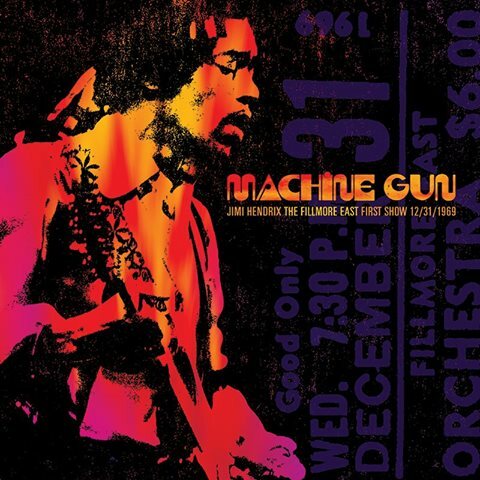 “Machine Gun: The Fillmore East First Show 12/31/69” will be available on CD, 2 LP 180 gram vinyl, high resolution SACD and in digital formats. Experience Hendrix is also releasing “People, Hell & Angels” on the same day. The 2013 compilation – which peaked at No. 2 on the US Billboard 200 – features studio versions of many of the songs featured on the “Machine Gun” album.